Where are the IELTS task 2s? In IELTS +TestZone, you must complete both task 1 and task 2 to get your feedback and score. This article shows you how to find the task 2s. 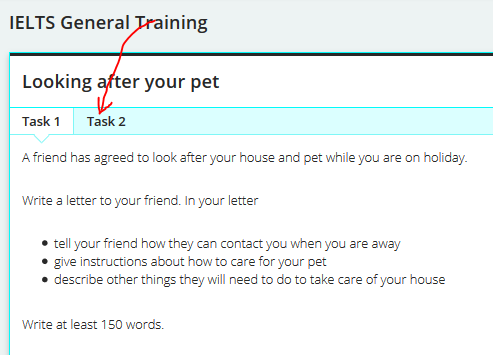 Just click where it says task 2 (see the red arrow above) and you will see the task 2. Like in the real exam, you must complete both task 1 and task 2 to get your feedback for the two tasks and an IELTS score that is the average of the scores for the two tasks together.